Once again, it compiles stuff from the many, differing faces of Death Metal, being Brutal Death Metal, Technical Death Metal, Melodic Death Metal, Grinding Death Metal, Progressive Death Metal, Traditional Death Metal, Slamming Death Metal, Blackened Death Metal, Thrashing Death Metal and even deader deadlier Death Metal. There’s modern stuff and there’s old schooled material, there are adventurous bands and traditional ones, there’s no-nonsense brutality and high-tech experimentation. Some take it serious, others hilarious. But in any case, every open-minded Death Metal adept will surely discover some interesting songs. Several bands I did know before, some I had heard of before, yet not been able to listen at, and more than two hands full of the bands presented are new to me. 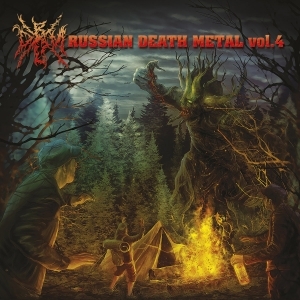 And seen the fact that there are quite a couple of mostly interesting ones amongst them, I think this compilation series is nothing else but a recommendation for every single fan of dead deadly death-breathing f*ckin’ Death metal.